Earlier in the year I used the film as a jumping off point for an examination of why universal economic constraints make a hostile invasion by an alien species unlikely. Specifically, I found Battle: Los Angeles’ motivation for alien invasion especially unconvincing [mild spoiler alert] — the films’ alien antagonists mount a laughably unbelievable invasion of Earth for the planet’s liquid water. Water is one of the most common compounds in the universe and planets with liquid surface water are almost certainly widespread in the local galaxy. Frozen water is even more plentiful, even in our solar system: a good portion of Uranus and Neptune’s moon systems are made up of water ice, and it strains credibility to suppose that a species capable of interstellar travel faces an energy constraint that prevents them from melting massive quantities of outer solar system ice. A hostile alien species in search of water has plenty of available alternatives to a contested invasion of Earth, especially considering the not-inconsiderable costs of transporting water out of the Earth’s (relatively) steep gravity well. But fantastical premise aside, I really enjoyed Battle: Los Angeles. As Anders notes, Battle: Los Angeles has more in common with Saving Private Ryan and Black Hawk Down than science fiction staples like War of the Worlds or Independence Day. At its core, the film isn’t a science fiction movie; it’s a war movie that uses aliens to depict US Marines in combat against a superior force. This is an interesting narrative, and a revealing one. A generation ago films like Red Dawn could use human adversaries to create a scenario of overwhelming enemy forces challenging sympathetic US military characters. Today, that’s less credible. While the increasing military prowess of potential adversaries like China is clearly on the road to near-peer status, even paranoid American film audiences have trouble seeing PLA forces as a threatening adversary for fictional US forces. The long delayed 2012 remake of Red Dawn, which replaced the original film’s Soviet and Latin American invaders with modern PLA occupiers, encountered a more concrete problem with Chinese invaders then military plausibility: China is a growing market for American films, and MGM’s distributors were (understandably) concerned about offending Chinese theater audiences. Red Dawn’s producers buckled, and replaced the PLA antagonists with a North Korean invasion of North America. Think about this for a moment: economic concerns forced US filmakers to turn to North Korea when in search of an existential military threat for American heroes. Remember, the DPRK is a nation of 24 million people: even if every single North Korean man, woman, and child occupied the US, there’d still be 13 Americans for every single Korean occupier — bad odds. Suddenly Battle: Los Angeles’ hastily imagined aliens don’t seem out of place in a story of infantry warfare. This says a lot about the decreasing incidence of war, and’s an encouraging anecdote — while the extremes of nuclear war and limited-scope local conflicts are persistent threats to human security, large conventional ground wars against human adversaries are becoming less common even in fiction. This doesn’t mean they’re impossible, or even significantly less likely. But it does tell us something interesting about American film audiences’ ideas of credible threats to US domestic security. 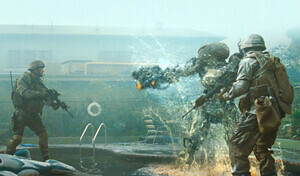 Returning to the subject of alien invasions, there’s another aspect of Battle: Los Angeles that challenges credibility. Like every alien invasion movie I can think of, the arrival of Battle’s aliens take the human protagonists completely by suprise: the alien spacecraft are detected only days before they enter the Earth’s atmosphere, and are mistaken for meteors until the moment alien warriors crawl out and begin ransacking Santa Monica. However, most imaginable forms of an alien invasion would be likely be detectable for decades before they arrived at Earth, because most imaginable interstellar propulsion schemes are extremely difficult to keep stealthy. Any spacecraft must decelerate before it reaches its destination; because many varieties of possible interstellar spacecraft travel at significant portions of the speed of light, deceleration is a long and energetic process. Nuclear pulse propulsion or exotic fusion and antimatter rockets capable of high acceleration flight would require decades long (for most possible flight times) deceleration burns to slow from interstellar speeds as they approached the solar system. These exhaust plumes would be highly visible from Earth, and give humans years of warning of approaching visitors. Other drive systems are similarly detectable. Beamed energy propulsion (where spacecrafts accelerate on extremely high powered sustained laser beams fixed at their point of origin) would be obvious decades to centuries before the spacecraft they powered arrived, and many beam propulsion schemes utilize fusion rockets to decelerate at their destination anyway. There are stealthier deceleration options available for sufficiently advanced aliens. A solar sail that used the momentum of reflected photos to decelerate would likely be stealthier than deceleration rockets, but would remain visible as a large, hot (1,000 K+) mirror in the infrared and visible spectrum. Magnetic scoop systems would be less visible: decelerating by impinging interstellar ions, a magnetic deceleration system would be detectable only as a large, powerful magnetic field. In addition to the high visibility of their decelerating propulsion systems, hostile aliens approaching Earth would have to contend with the thermal emissions of their spacecraft. These infrared emissions are extremely difficult to stealth: barring exotic technologies, a spacecraft will always be a hot moving object against a cold background, making it inherently more visible than asteroids and other solar system debris. Of course, any discussion of countering hypothetical invading alien forces involves a lot of assumptions. But in the context of Battle: Los Angeles these aren’t unjustified. Battle: Los Angeles depicts uniquely primitive alien invaders, at least compared to the alien’s science fiction invasion-genere comrades. The aliens of Battle: Los Angeles appear to use weapons with capabilities broadly similar to our own, cybernetics not far beyond that plausibility available to near-future humans, and aircraft that use broadly familiar reaction propulsion rather than more exotic lift schemes. In this technological context discounting faster than light travel, (extremely) exotic propulsion and stealth technologies is reasonable. Of course, the fictional world of Battle: Los Angeles exists in the context of its narrative: the film’s writers limited their villains’ technology to make infantry combat between Battle’s Marine heros and the alien foe believable. However, despite these narrative limitations the film’s still an interesting springboard for discussion. That’s what makes fiction interesting. Your premise about the expense of interstellar travel vs any potential benefits (including our resources, or using humans for slavery) was explored more fully in the book “Starflight and Other Improbabilities” by Ben Bova. The book “The Eerie Silence” by Paul Davies goes on to show that aliens would probably not have compatible biological systems for them to seek us out as mating partners, food, etc. Moreover, the chances are that other civilizations have likely advanced so far beyond us (or we them) that we have little chance of having a peer-to-peer encounter. I found your discussion here fascinating though, including the part about propulsion systems. Nuclear pulse engines were the topic for my bachelor’s level graduation project/thesis in Physics. Thanks for the kind words! I’ve always found nuclear pulse engines fascinating – it’s amazing that there’s a propulsion scheme that could quickly span the solar system that humans could build today if we wanted to. The idea it was for water is based on about five seconds of one guy talking on an in universe TV news program, it was a guess and never indicated to be canon. The aliens seem like they might be semi-aquatic, but “they’re here for water” is never said anywhere as being definitive that I can ever recall. Behind the scenes and supplemental material seems to indicate the idea they were actually quite possibly driven here either out of their own world not being habitable anymore or another faction their driving them into exile. Either way it’s implied to be a desperate one way trip to claim a new homeworld, not about resources or slaves. Given this background their tech being somewhat ramshackle and seemingly underdeveloped also suddenly makes allot more sense, and it’s a viable motive for an invasion (let’s face it would Earth really allow tens of millions of aliens to set up their own state if they just asked nicely?). As for how they got their I personally favor a form of FTL. It best fits the circumstances and also the seen tech level. FTL is often taken as a sign of “advancement”, but it doesn’t have to be since it’s pure magic it could just as easily be something fitted on the equivalent of a modern space shuttle as the starship enterprise. It also doesn’t have to be mounted on the ship in question at all. If one presume some sort of fixed FTL gate or the like at the alien homeworld it’s easy to purpose they can appear very close without significant velocity and simply coast into the atmosphere to land. Their “ships” may have been nothing more then reentry vehicles gently shoved through the portal. This would fit if the FTL system is something that’s not far advanced. Perhaps it’s something we’d have discovered ourselves in say 50 more years. The aliens really wouldn’t be too much more advanced us aside from this one critical technology, so the “ships” they’d sent wouldn’t be intergalactic battle cruisers so much as beefed up Apollo capsules. They couldn’t just dominate orbit with their war cruisers, as they ships would have only just barely enough life support to get the crews crammed in like sardines down to the surface. It’s really not hard to coconut a scenario to support nearly any situation you want if you just tweak a few technological variables, and it’s hardly a mark against a given story either as even the greatest sci-fi authors have set up very contrived settings for various reasons.